Review: Being afraid of your own shadow takes on a whole new meaning in Graham McNamee's ghost story, Beyond. 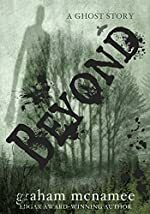 Beyond is a tale of Jane, a teenager who is afraid of her own shadow, and she has every right to be because her shadow is something menacing and horrifying that haunts her day and night. Jane has had a bizarre life. Some might say she has a death wish. "It started with my difficult birth. Mom nearly died having me. When they finally dragged me out into the world, I was limp and lifeless, born without a pulse. They had to shock my tiny heart into beating. Born dead. That set the mood for everything later." Her parents believe that Jane is a miracle - the beautiful little girl who will grow up to be strong and healthy. But something haunts Jane from that day forward. After a series of events brought on by the pull of the shadow that threaten her life, Jane's heart stops once again. This time, however, when she's brought back to life, instead of a shadow that "merely" forces her to hurt herself, the shadow becomes more angry and haunts her day and night - speaking to her in a menacing voice, driving her insane. If it weren't for her one true friend, she'd probably have given up a long time ago. Lexi is the one person in which Jane confides her fear of her shadow and its increasing power. Together, they try to make sense of this specter and find a way to get it to stop before Jane runs out of "lives" and the shadow takes away her last one. Beyond is a "one-of-a-kind" book. It is so much more than a ghost story where a ghost acts frightening and can be harmful. In Beyond, the ghost is attached to you! And, it forces you to hurt yourself with the hopes of killing you. This is so much more unsettling because everyone has a shadow, and everyone has jumped at some time or another at their own shadow. So any reader can relate to a fear of shadows. But the fear that a shadow can indeed be menacing and deadly will keep readers up at night. Simply stated, the plot is intriguing. However, the plot is not the only strength of Beyond. McNamee uses such matter-of-fact prose that readers quickly begin to relate to Jane. "I remember dying. After I got injured my heart stopped and I flatlined. I was done and gone. But I wasn't alone. There was something waiting for me when I died. Something dark and cold tried to take my soul away. When they brought me back to life I escaped from it. Left it behind. But what if it came back with me, followed me home like a hungry stray?" Instantly a reader is eager to read more. Plus in light of Jane's frequent "accidents" she is seen as an outcast at school. Teens are constantly concerned with their image, but Jane's character reminds readers that there is more to a person than their image and that it's okay to be "you". When Jane is faced with names like "Psycho Jane" or "Reaper Creeper", Jane takes it for what it is and moves on giving her a strength many teens lack. But, Beyond wouldn't be a good ghost story if it wasn't packed full of suspense - and it is. Every chapter ends forcing readers to think "just one more chapter" and next thing they know the hour is late, they are huddled under a blanket for protection, and they are turning the last page of the book. Then they are left with the nightmares of the shadow - their shadow! We would like to thank Random House for providing a copy of Beyond for this review. Have you read Beyond? How would you rate it?